James Robertson was born in 1958 and grew up in Bridge of Allan, Stirlingshire. A poet, editor, novelist and publisher, he is an active and prolific writer, enjoying stints at Hugh MacDiarmid’s cottage, Brownsbank, near Biggar, Lanarkshire, and as the first Writer-in-Residence at the Scottish Parliament. He set up Kettillonia, a small pamphlet press in 1999, and was general editor of Itchy Coo, the successful Scots children’s book imprint at publishers Black and White. 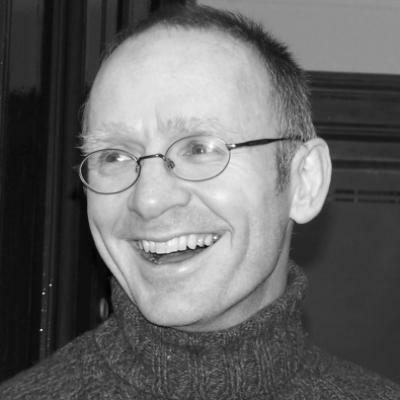 His novel Joseph Knight won the Saltire Society Book of the Year in 2003 and the Scottish Arts Council Book of the Year award, and in 2010 his Scottish epic And the Land Lay Still won Robertson a second Saltire Society award. James Robertson translates classic children’s novels, such as Roald Dahl’s The Fantastic Mr Fox as The Sleekit Mr Tod and George’s Marvellous Medicine as Geordie’s Mingin Medicine. Wi glib notes sain the simmer’s green. On thee the sey-piece o’ her skill. On yonder ruin’s lofty snout. Is weel contentit wi his lot. In lieu of lav’rock’s sober grey. O’ winter’s dreary dreepin snaws. Wi a’ the blythness of the spring? They downa suffer you to drink. An’ hail you wi a gratefu voice. For a’ that life ahint can spare. The essence of a paltry bubble. <n1> First published in The Weekly Magazine, 12 August 1773. <n2> fool: make look foolish. <n3> but mergh: without strength. <n4> Tantalus: in Greek mythology, a Lydian king whose father was Zeus. He told the secrets of the gods to mortals, and was punished by being placed up to his chin in one of the rivers of Hades, with a fruit-laden tree just out of reach above his head. Whenever he tried to pluck the fruit, the waters receded and he failed to get any, which left him in agonies of thirst and hunger. From this story comes the word “tantalise”. <n5> your girnal’s grist: the size of your meal-chest, i.e. your wealth. <n6> Shame fa the hair: not so much as a hair. Recorded, edited and produced by Laura Cameron-Lewis and Andrew Eaton-Lewis of (g)Host City. www.virtualfestival.org and mastered by Hamish Brown.